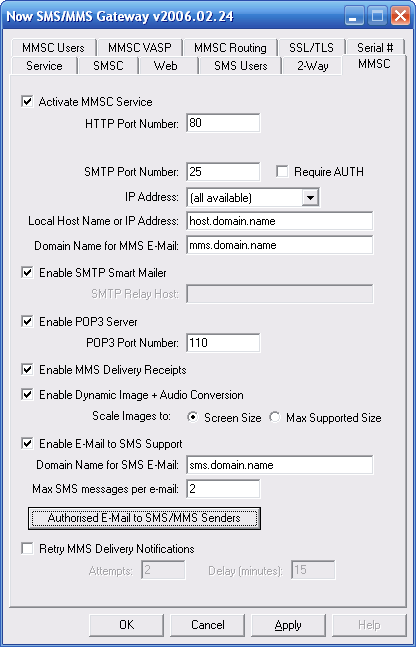 The POP3 server allows user accounts defined in the “SMS Users” dialog to connect via the POP3 e-mail protocol in order to receive SMS or MMS messages. When defining an account in the “SMS Users” dialog, it is necessary to check “Enable SMTP Login for this user” before the user account will be allowed to connect using either POP3 or SMTP. To understand how the POP3 server can be used, it is important to understand the difference between POP3 and SMTP. SMTP is the protocol the e-mail protocol that is used when an e-mail client wants to send a message. POP3 is one of the e-mail protocols that can be used when an e-mail client wants to receive messages from a server. When configuring POP3/SMTP e-mail client, the SMTP server is often referred to as the “Outbound Mail Server”, while the POP3 server is referred to as the “Inbound Mail Server”. To define an e-mail account to an e-mail client that supports POP3/SMTP, it is necessary to define a connection to both the POP3 and SMTP server. The e-mail client is configured to connect to the NowSMS server using the SMTP and POP3 port numbers configured in the MMSC configuration. The e-mail client can use either plain text or APOP authentication for POP3. The e-mail client must use plain text authentication for SMTP. In the following sections we will detail the process of defining this type of e-mail account to either Outlook Express or Mozilla Thunderbird. While it is possible to configure your e-mail client to connect to multiple e-mail accounts, so that you can connect to your normal e-mail server and NowSMS simultaneously, it may be easier to configure a separate e-mail client for NowSMS. The choice is yours, but especially if you are configuring the system for novice users, it may help them to think that they use a different e-mail client whenever they want to send SMS or MMS messages. An e-mail client can send an SMS message by sending to phonenumber@domain.name, where domain.name is the “Domain Name for SMS E-Mail” that is configured in the MMSC configuration. An e-mail client can send an MMS message by sending to phonenumber@domain.name, where domain.name is the “Domain Name for MMS E-Mail” that is configured in the MMSC configuration. Additional information on this configuration process can be found in the following section: Configuring the SMTP Server. One of the limitations of using the e-mail to SMS facilities is that it is not possible to support SMS to e-mail replies for multiple users. The e-mail to SMS facility can allow any e-mail sender to send an SMS message to any phone number. However, if the phone recipient attempts to reply to the SMS message, when the reply message is received by NowSMS, it is not possible to reliably match the reply to the originally sent message. This is because there is no attribute that can be set in the SMS message that indicates that it is a reply. Therefore, it is only possible to define static routes for SMS to e-mail delivery. If multiple e-mail users need to be able to send SMS messages and receive replies SMS replies back to e-mail, then it is necessary to dedicate a phone number (or GSM modem) for each of these users. There are three ways to configure NowSMS to route received SMS messages to an “SMS Users” account associated with a POP3 e-mail client. 1.) All SMS messages received via a specific GSM modem connection can be routed to a specific “SMS Users” account. To configure this support, highlight the GSM modem definition on the “SMSC” configuration dialog, and press the “Properties” button. 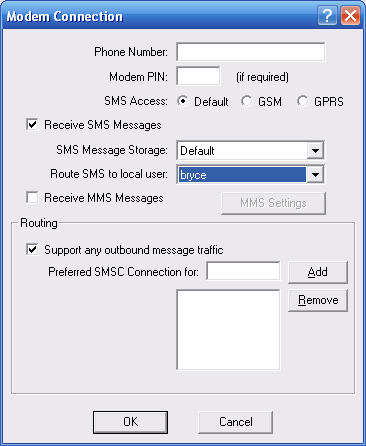 Use the “Route SMS to local user” parameter to specify an account which should receive all SMS messages that are received via this GSM modem. 2.) The “2-way” facility in NowSMS, which is used to process received SMS messages, is normally used to deliver received SMS messages to an HTTP script or executable program. However, it can also be used to route received SMS messages to an e-mail address. When defining a “2-way” command in the “Received SMS Command Table”, it is possible to define a “mailto:” link in the “Command to Execute” field. This facility can be used to route a message to a local “SMS Users” account by specifying a “Command to Execute” of “mailto:localuser@mms.domain.name”, where “localuser” is the name of the “SMS Users” account, and “mms.domain.name” is the “Domain Name for MMS E-Mail” as defined in the “MMSC” configuration dialog. For additional information, please see the 2-Way SMS section. To use this support, check “Enable SMPP Login for this user” (even though the account will be using SMTP instead of SMPP). Check “Route received messages to user via SMPP”, and specify one or more phone numbers (separate multiple phone numbers with a comma), where if the recipient of a message received by the gateway matches a phone number listed here, the message will be queued for delivery to this “SMS Users” account, where the account can retrieve it using either the SMPP or SMTP protocol. Note that this routing applies to all messages processed by NowSMS where the recipient phone number associated with the message matches a phone number in the “Recipient address(es) to route to this user” field. It applies to both messages received from an SMSC connection, as well as if another user account on the NowSMS server attempts to send a message to this phone number. 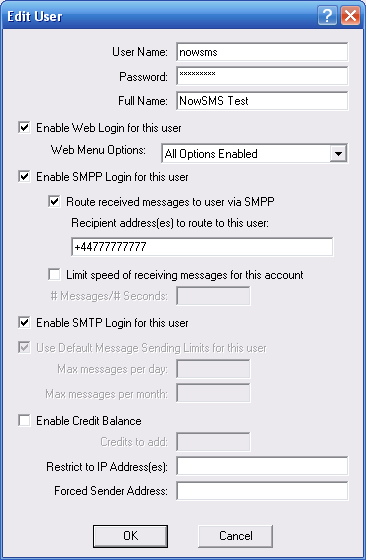 There are three ways to configure NowSMS to route received MMS messages to an “SMS Users” account associated with a POP3 e-mail client. 2.) 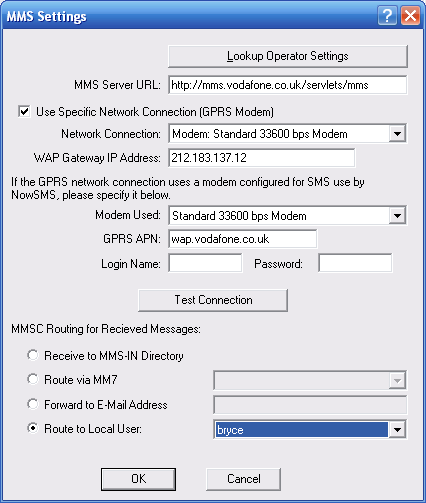 All messages received via any defined “MMSC VASP” connection can also be configured to be routed to a local user account, using a configuration setting similar to the one defined for GPRS modems.